This, right here, right now, is a pretty exciting time for anyone who's trying to eat better- whatever "better" means for them. And I say this for two reasons. First, we are seeing a revival of home cooking and an enthusiasm for "real" food, so that any kind of diet change is more likely to involve tasty, wholesome food and less likely to involve some kind of package with a manufactured low-calorie concoction. Second, there are hundreds of books, blogs and websites out there with recipes and ideas for almost every kind of diet one can think of. So if you're looking to make a change, there are resources out there to help you. In my case, eating better means eating in a more carb-conscious way, because I have insulin resistance and my body struggles to metabolize carbohydrates. I'm making this change while eating the way I've chosen to for the last 20 years- a lacto-ovo vegetarian diet. My desire to cut down sugar and limit carbs overlaps with many of the popular diets of our time- Paleo, Whole 30, South Beach and others. My desire to eat a more plant-based diet overlaps with those who eat a vegan or raw food diet. I don't have to follow any of these diets. I don't have to embrace any of them (in fact, some of them irritate me with their pseudo-science) or agree with all of their features. But I can use ideas and recipes from people who are on these diets. The important thing is to keep meals interesting, tasty and varied within my new food rules, such as they are. Because that's what will help me stick to the plan. So I've been busy bookmarking new recipes to try. I don't need to watch my fat intake- in fact, fat keeps me feeling full and satisfied, so creamy salad dressings are definitely on the menu. Apart from the Caesar salad dressing, I've been making an avocado yogurt dressing, a lemon caper olive oil dressing and a tahini lemon dressing. I've started stocking the fridge with a jar or two of dressing and a bowl of prepped salad. Add some cooked beans, lentil dal or pan-fried tofu and a good meal is just seconds away. This tahini lemon dressing recipe came from a cookbook I found at the library, Oh She Glows by Angela Liddon, a book that came out of the blog of the same name. Angela has a knack for making vegan recipes that sound very hearty and tempting. I picked up several ideas from the book- the favorite being falafel bites- baked falafel served in lettuce cups with a cucumber-tomato chopped salad and a tahini dressing. Doesn't that sound good? The lemon tahini dressing recipe is at the bottom of this post on Oh She Glows. You simply blend the ingredients in a food processor: tahini, lemon juice, nutritional yeast, minced garlic, salt and pepper, adding some water and olive oil to thin the dressing as needed. Pour the dressing into a jar and store it in the fridge. It is a bold, flavorful dressing, with a cheesy flavor although there's no dairy in it at all. Lila begs me to lick the spoon and will eat the dressing straight-up with a spoon if I let her. So our supper last night was a bed of greens with cooked green lentils, olive tapenade and a good bit of lemon tahini dressing. It is amazing how much my tastes have changed in a few short weeks. I would have sworn up and down that a salad plate like this is a skimpy dinner that would never leave me satisfied. But it left me fully satiated when I ate at 6 PM yesterday, and kept me so full through the night and morning that my first meal today was at 10 AM. Color me shocked. The dressing is also wonderful over roasted vegetables, by the way, especially roasted cauliflower and roasted eggplant. 1. If you think salads are dull and boring, try a zippy dressing and you just might change your mind. 2. Keep raw veggies prepped and ready in the fridge and you'll start reaching for them when you need a snack. 2. Explore recipes from vegan, paleo, low carb (and other diet-based) blogs for fresh ideas to eat more of the things you want to be eating. And also to change your mind-set that leaving out the rice, tortillas, noodles and pasta means there's nothing good left to eat. Don't be deterred by labels. We can take different paths to get to the same goal. Wow, that dressing sounds absolutely delicious. I like salads but I get bored with the same-old same-old dressings, so this tahini dressing is going to be a good change. I'm going to try this one very soon. Thanks for sharing. I know- a new tasty dressing is just the thing to liven up a salad- especially in winter when veggies are not at their best. Dear Nupur, like many other posts of yours this one makes me want to give you a tight hug! :-) Firstly because I really missed your post yesterday, secondly because I Love the idea of customizing ones diet by including the wisdom from different diets to come up with something one can happily adopt for a lifetime. That is exactly what I am doing right now and really enjoying the benefits. Last but not the least, you have inspired me to think differently about salads. In freezing winters here, I really cannot stomach the idea of having something cold and raw but there's a whole new world of hope from warm salads with roasted vegetables, lightly sauteed sprouts and greens and to top it all some delicious homemade dressings. Last evening, I had some roasted broccoli lightly flavored with garlic, lemon juice and sea salt and a side of baked extra firm tofu marinated in thick soy sauce, black vinegar, garlic powder and dark sesame seed oil. My tastebuds were singing a happy song and my tummy was happy and content for next 12 hours. I also made a tahini dressing recently with plain yogurt, salt and a pinch of garlic powder to drizzle on my sweet potato baked fries. It also went surprisingly well with steamed lauki muthias. 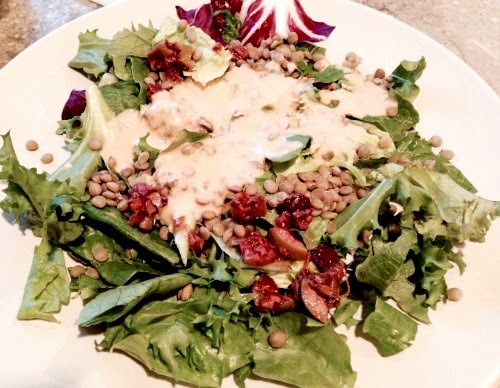 Thanks for this wonderful post and I will try the lemon tahini dressing tonight that Lila can't get enough of :-). Thank you my dear. Your meal sounds so delicious!! Tahini dressing is indeed wonderful and so versatile. My Israeli friends go through so much tahini- they put it in everything, including as a spread for toast (with honey). what is nutritional yeast and where do i get it from? Thanks R! It has been so much fun so far and with gratifyingly quick results which makes it easy to keep doing the right things. Have a great week!! Loved this post Nupur. Gave me a great idea for spicing up and enlivening my mum's meals since for the past week since she's been here I've been racking my brain trying to come up with interesting and varied not to mention satisfying meals for her esp. leading up to her surgery in a couple of weeks. The thing is we are still working on her psychological approach to eating which is taking longer than I'd expected but we've still made progress. She craves fruits, milk and carbs and I've been coaching her and us on cutting down on those to opt for healthier options. The lemon tahini dressing on steamed or roasted veggies can def. become a regular on her menu, I think she's love it. I also think it might be a good idea for me to steam a bunch of veggies ahead of time and stock them up in the fridge because I'm always rushing around trying to prep and cook her meals to time with her insulin shots. And great going for you. Those small changes you've made are already paying off. So thrilling. Hi Deepa- My best wishes to your mom. It is so hard to change habits so kudos to her for hanging in there. For myself, I have to say that I much prefer the taste of roasted veggies compared to steamed ones. I do roast a big pan of veggies to eat over 2-3 days. Good luck!! I absolutely love angela's book that I purchased last year. Try the asparagus potato salad with avocado dressing too. It is one of my favorites, along with her kale salad. Any idea how long home made dressings stay in fridge? I always worry about them spoiling past couple of days. Neha- I've been using up the dressing in 3 days or so- they never seem to last long because my husband and kid want to eat dressing with a spoon- go figure. I don't keep avocado ones at all though- they seem to be more perishable. Those I make for the meal and use up. Dressings make or break a salad IMO. Back home we just had the simple cucumber salad for everyday meals and a special one with beets, tomato, onion, vinegar and chilli. So when I tell my folks back home we had salad for dinner they wonder is that food enough for a meal? As a matter of fact I hated salads for a long time, but have come around to loving them now. My current favorite is a mix of salad greens, cherry tomatoes, cucumber and caesar salad dressing. The colors of the mixed greens and the zing of cherry tomatoes makes me actually look forward to eating salads. J- Yes, I agree, there are salads and there are salads. The word does not mean much, it is what you put in in (light vs. hearty) and the dressing. I too now look forward to big salads with lots of goodies like olives and nuts. Visiting here after a long hiatus, Nupur, and I'm sorry to hear about your health challenges. But you're dealing with it with so much grace and verve, and inspiring so many readers like me along the way. I'm so glad to be back in your (blog) world again! Hi Niranjana- How nice to see you here! Hope you've been well. My health challenges are shared by so many that I decided to talk about it publicly. But it is going very well so far- fingers crossed! Hi Monica- Thanks for this nice note! I'm the same way- instead of banishing certain foods entirely from my life, I'm just not bringing them into the house. I can eat them outside- that automatically means I eat them rarely since we eat 90% of our meals at home. And the salad toppings make the salad hearty and filling and crave-worthy for sure. http://www.carlsbadcravings.com/southwest-salad-creamy-avocado-salsa-dressing/ just saw this and thought of you. Oh I love a good salad, nothing better than the perfect mix of different flavors and textures.This dressing looks delicious and I happen to have all the ingredients at home. Will definitely try this. Since citrus has been abundant lately, I segment an orange or two to add to a salad and then squeeze out the juice from the remnants and use this juice as the base for a quick dressing with balsamic vinegar, olive oil and s&p, so delicious! Anu- Your citrus salad sounds irresistible- thanks for the idea! Hi Nupur, wanted to chime in and let you know what a great job you are doing out here. I have been wanting to make similar changes all my life but I have never been able to commit all this while. Since reading this however, I have made two tiny changes that I hope will better my health - I have decided to sleep earlier (and without my electronic devices to accompany me in bed) and to exercise about 20 minutes a day, 5 days a week. Two little changes, nothing as much as what you are doing but I am happy to be able to start and hope i can stick it through. Thank you for the inspiration you share with us. Good for you, Harini! And I'd say that your small changes are not that small at all- good sleep and moving a little more are two of the best things one can do. Good luck to you! !